When it comes to securing all the parts of a modern distributed network, endpoints remain the most vulnerable outlier. Mobility has brought a flood of different devices that cross in and out of enterprise networks on a daily basis. 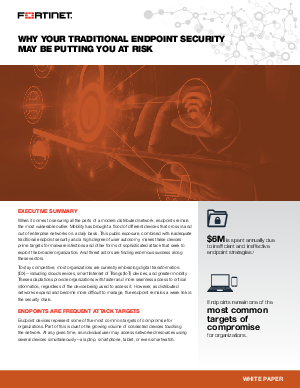 This public exposure, combined with inadequate traditional endpoint security and a high degree of user autonomy, makes these devices prime targets for malware infections and other forms of sophisticated attack that seek to exploit the broader organization. And threat actors are finding enormous success along these vectors. To stay competitive, most organizations are currently embracing digital transformation (DX)—including cloud services, smart Internet of Things (IoT) devices, and greater mobility. These adaptations provide organizations with faster and more seamless access to critical information, regardless of the device being used to access it. However, as distributed networks expand and become more difficult to manage, the endpoint remains a weak link in the security chain.